Invisalign is a clear and invisible braces system that enables patients to get the smile of their dreams without anyone else even knowing they are wearing braces. It is the perfect treatment for people who are worried about undergoing orthodontic treatment and having to wear a metal brace. The system is virtually invisible to the outside world, which means you’ll be able to smile and chew as you would normally, without the embarrassment of a mouth full of metal. Invisalign is often much more comfortable than traditional braces. The system doesn’t have wires, like traditional braces, that tend to irritate the sides of your mouth, tongue and gums. 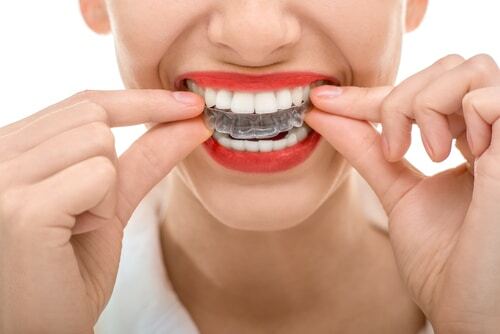 The aligners are easily removable, making the cleaning of both your teeth and the Invisalign aligners much quicker and easier, particularly when compared to traditional braces. There are no restrictions on the types of food that you are allowed to eat, like there are with traditional braces. Make an appointment with one of dHealth Dentistry’s Invisalign experts. Our experienced team will create a customised Invisalign treatment plan, tailored specifically for your needs. We’ll also fit and measure you so that your custom Invisalign aligners can be created from a mould. Once you’ve received your customised aligners, you’ll then need to change the aligner every two weeks as you progress through the treatment.